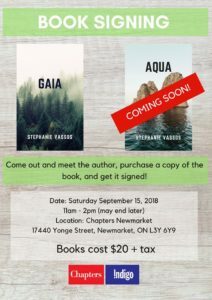 As you may or may not know, Stephanie Vassos published a fictional novel last summer called GAIA, and she’s currently in the editing phase of the sequel AQUA (coming soon). A lot of you have been asking where to get a copy and how to get it signed, and we’ve got a cool solution for ya! On September 15, Steph will be having a BOOK SIGNING at Chapters in Newmarket! If you want to come out and purchase a book, get a copy signed, support Steph and grab a cool photo with her, or if you just want to walk by on your way to pick up a drink at Starbucks, we would love that! We’re so excited! 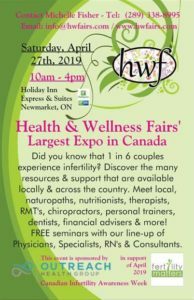 See you all there!!! P.S. For those of you that don’t live close by but still want to grab yourself a copy of GAIA (AQUA is not available yet), message us and we will hook you up with the link, or with a copy. P.P.S. Don’t ever give up on your dreams.